All lenses have a maximum aperture, or lens opening, used to capture light. On most zoom lenses the maximum aperture will change as you zoom. As you zoom, the optics move to focus at the new zoom setting. These zoom lenses are said to have a "variable" aperture. To achieve the widest possible aperture, you need to be at the widest possible zoom setting. All NIKKOR lenses list the widest possible aperture on the lens barrel. Zoom lenses that have a variable aperture will show the maximum aperture range. For example, "f/3.5 - f/5.6" will be noted on the lens barrel as 1:3.5-5.6 (below left). The 3.5 and the 5.6, are referring to the maximum aperture the lens can achieve for each end of the zoom range. Some higher-end lenses can maintain the largest aperture throughout the entire zoom range, so only one number is detailed. (f/2.8, below right). Fixed aperture lenses utilize more sophisticated lens elements than variable aperture lenses; and are also heavier than variable aperture lenses. As such, these lenses are generally more expensive than variable aperture zooms. A lens with a wider maximum aperture is described as being "faster" than one with a smaller maximum aperture. At a given ISO (light sensitivity) you can achieve a correct exposure at a faster shutter speed with a wider aperture than with a smaller aperture. Basically, the shutter does not have to stay open as long to let in the same amount of light, so it's faster. Faster shutter speeds stop motion, making it possible to get sharp results when shooting fast moving objects. 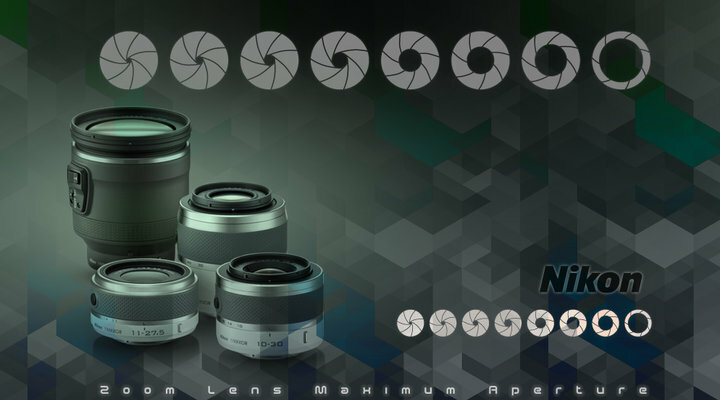 Maximum aperture fixed focal length NIKKOR lenses utilize lens elements that are larger than those used in other lenses. The larger the maximum aperture, the more the background can be blurred for a pleasing effect; this effect is referred to as "bokeh" and is used by portrait, nature and sports photographers. Also, the wider the maximum aperture, the more sophisticated the lens design, and the more expensive it will be. For example, a lens with a maximum aperture of f/2 will cost more than a lens with a maximum aperture of f/4. The larger the maximum opening, the "faster" the lens. Zoom lenses can have either a fixed maximum aperture or a variable maximum aperture.